Brussels – Monday 01 February 2016 – Human Cities Network is glad to announce this recent collaboration with Design Department of the Politecnico di Milano and College of Design and Innovation at Tongji University with Shenzhen Bi-City Biennale of Urbanism\Architecture. “Open Your Space” proposes a unique design proposition for collective space and public life. It promotes an emerging paradigm involving new processes in imagining public space and co-creation; and adopts an inclusive approach for social innovation towards collaborative actions for an integrated public life. “Open Your Space” (OYS) is an ongoing research and design project. Reflecting on the current situation of urbanization in China, the project explores an urban community scenario that concerns the physical spaces as well as their social and cultural significances. It tends to activate design factors as how they can intervene and catalyze urban life and built environment. 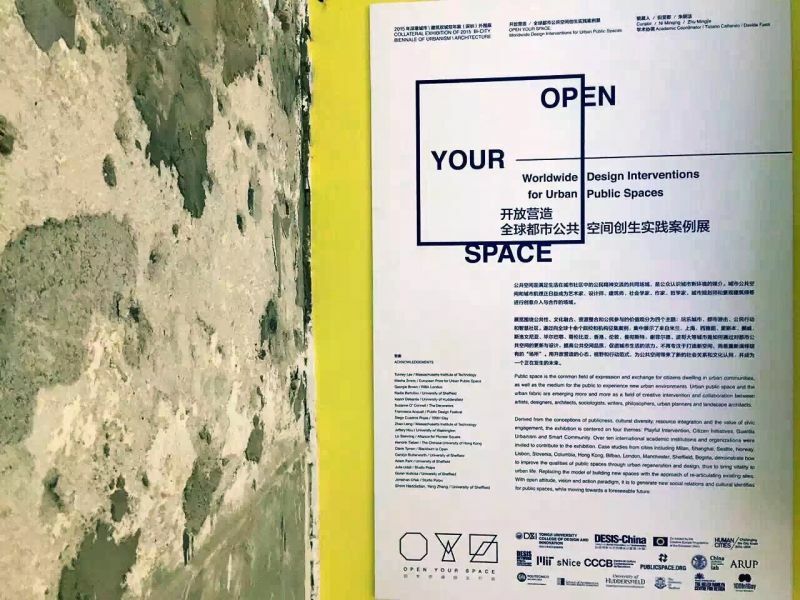 As a pilot project, Open Your Space @ Siping community (OYS@Siping) is one of the collateral exhibitions of the 2015 Bi-City Biennale of Urbanism\Architecture. Landed in the Siping community of the Yangpu District in Shanghai, the project consists of three parts: an exhibition of case studies that showcases design interventions in urban public spaces worldwide, 10 site projects, and over 50 micro design interventions in the open spaces at Siping community along with a community creative festival and several cultural events. The exhibition included an extract from the “State of the art” best practices collection developed by Human cities. The opening ceremony took place 19 December 2015 at SPace in Yangpu District, Shanghai. It was followed by a Creative Market and in the evening citizens were invited to join a Community Movie Night. The next day SPace opened its doors for Creative Placemaking which engaged citizens to change its community. The Exhibition of Worldwide Design Interventions in Urban Public Space will be hosted by SPace till the 5 of March 2016. An impression of the event is shown in this video. This project is organized by Tongji DESIS (Design for Social Innovation and Sustainability) Lab.